This is quite a large aspiration, but the University of Wisconsin–Stout gymnastics team is definitely up to the challenge. They are a very determined group of girls, who look to improve on all fronts. “I want to improve my forms, my scores, and hit consistently throughout the rest of the season,” said Perez. “I just wanted to compete this year, especially with my injury,” said Peterson, who has been sidelined after only competing in one meet during her freshman year, and then tearing her right ACL once and left ACL twice to keep her out for almost three seasons. Peterson has been able to fight through the injuries and eventually compete this season on the uneven bars in only her second meet of her collegiate career, against the University of Wisconsin–Oshkosh. The season has gone well for the ladies, posting one win, three second place finishes, a third place finish and one fourth place finish in seven meets this season. These good team finishes have come from stellar performances from experienced upperclassmen and young freshmen. 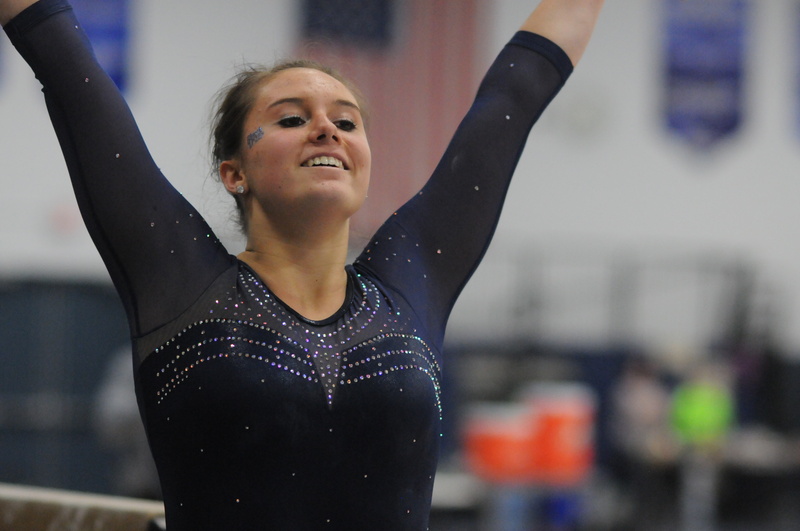 Almost every gymnast has set a personal record at least once this season; some have even done it twice. In the team’s most recent performance against Winona State University last Saturday, Feb. 28, the team broke the Stout vault and balance beam records. Jondahl had a personal best and tied the school record on vault with a 9.700. Every gymnast scored above a 9.000 at the Winona meet. The new records now stand at 47.800 on vault and 46.975 on beam. These scores helped the ladies to their best team overall score of the season (188.325). These performances have not only called for physical strength and toughness but also mental toughness. “It is really mentally tough. A lot of people only see the physical aspect of it, but they don’t realize how mentally tough you have to be to do this sport. This mental toughness has been seen throughout the team’s performances. With the last regular season meet in sight, the ladies look to make that final push. “We started off with a couple of injuries, a little rough, but we’ve come back. We’re really pulling it together. Our team score keeps improving every meet, and we’re looking good,” said Counts. The Blue Devils will head to Eau Claire for their next meet this Friday, March 6 at 6 p.m. to take on the Blugolds, and then will travel to Hamline University for the WIAC championship; these two meets will help them make the push to Nationals.